Wilhelm Steinitz (May 17,1836, Prague, Czech Republic (then Austrian Empire) - August 12 1900,New York City, United States) was an Austrian chess player, and the first official World Champion of chess. Known for his original contributions to chess strategy such as his ideas on positional play, his theories were held in high regard by disparate chess players such as Aron Nimzowitsch, Siegbert Tarrasch, and Emanuel Lasker. 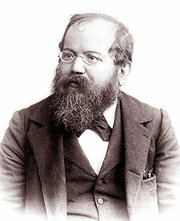 Steinitz was world champion from 1886 to 1894, retaining the title in four matches against Zukertort, Chigorin (two times) and Gunsberg. He lost two matches against Lasker, his successor as world champion. Steinitz adopted a scientific approach to his study of the game. He would formulate his theories in scientific terms, and "laws". Steinitz became a US citizen on November 23 1888, having resided for five years in New York, and changed his first name from Wilhelm to William. After losing the world title, Steinitz developed severe mental health problems and spent his last years in a number of institutions in New York, making a series of increasingly bizarre claims (including his having played - and won! - a game of chess with God conducted via an invisible telephone line). His chess activities had not yielded any great financial rewards, and he died a pauper in his adopted home city in 1900. Wilhelm/William Steinitz is buried in Brooklyn. Lasker, who took the championship from Steinitz, once said, "I who defeated Steinitz shall do justice to his theories, and I shall avenge the wrongs he suffered." Steinitz� fate, and Lasker�s keenness to avoid a similar situation of financial ruin, have been cited among the reasons Lasker fought so hard to keep the world championship title. This article is based on the article Wilhelm Steinitz from the free encyclopaedia Wikipedia and stands under the GNU-Licence for free documentation. In the Wikipedia a list of the authors is available.